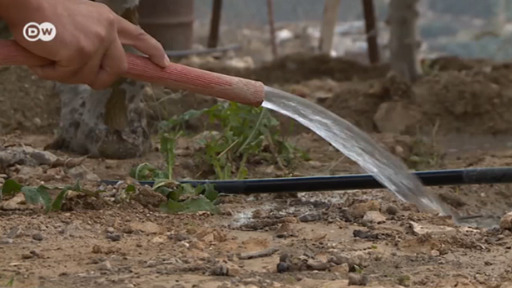 Our reporter Mabel Gundlach traveled through Jordan and learned from the Bedouin how a barren land can still be green. In the process, she even met a real-life princess. ... twelve kilometers through Jordan's Wadi Karak. Even with its beautiful waterfalls, hanging gardens and sandstone gorges, that's exhausting. Transporting camera and tripod through the monumental valley ... this part was still comparatively easy. But getting the equipment across a 30-meter waterfall was quite challenging. Jordanian princess Basma bint Ali clearly had fun during our shoot. The founder of the Royal Botanic Garden - here seen speaking to Global Ideas reporter Mabel Grundlach - is not just an enthusiastic plant expert but also a passionate advocate for biodiversity. Getting up close to witness the goats being milked can leave a mark. In this case, a stubborn milk splatter on the camera. … the head of a bedouin clan and - like the princess - a complete plant expert.